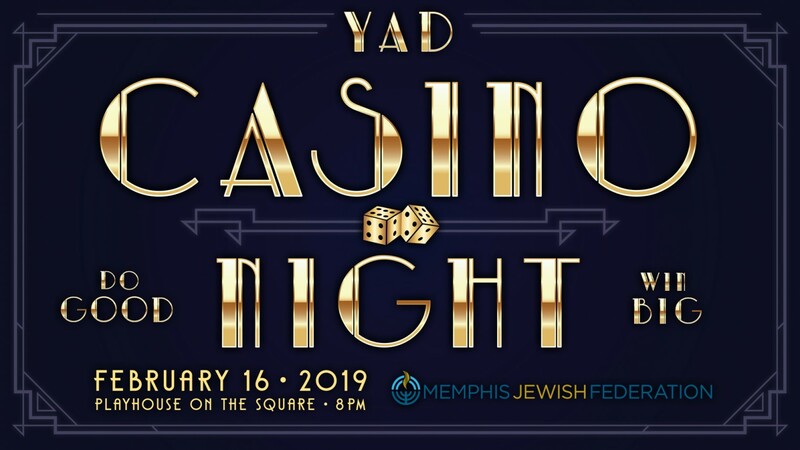 Join Memphis Jewish Federation's Young Adult Division (ages 21-45) for a fabulous evening of casino games, raffles, and delicious kosher drinks and desserts. At least $18 of every ticket sold goes to taking care of the needs of the Jewish people and building a vibrant Jewish future here in Memphis, in Israel and around the world. It’s true. Just by coming to YAD Casino Night, you become a donor to the Jewish Federation and a supporter of the work that we and our partner agencies do to change lives every day. Broaden your impact on our Jewish community and receive additional raffle tickets and recognition as an event sponsor! The Young Adult Division (YAD) of Memphis Jewish Federation is a dynamic group of Jewish young adults under age 40, single and married, who are committed to building a stronger Jewish community in Memphis, Israel and throughout the world. YAD engages young adults in Memphis through a wide variety of social, educational, community service, philanthropic and leadership development programs allowing them to meet their peers and develop meaningful ties to our Jewish community. Participating in YAD events is a great way to meet new people and have fun, while making a difference in our community. For more information, please contact Lauren Taube at ltaube@jcpmemphis.org or (901) 767-7100. A fun night celebrating for a cause with live music, great prizes, a photo booth and delicious food.